If you were looking for a more feature-packed competitor to the renowned Timely alarm clock, and don’t quite dig the idea of using your phone’s screen to wake you up silently, you may want to give Smart Alarm Clock a shot. It monitors the sounds in your bedroom, and also keeps track of your sleep cycles. This means it’ll know exactly when to wake you up so you don’t feel like Grumpy Cat in the morning. 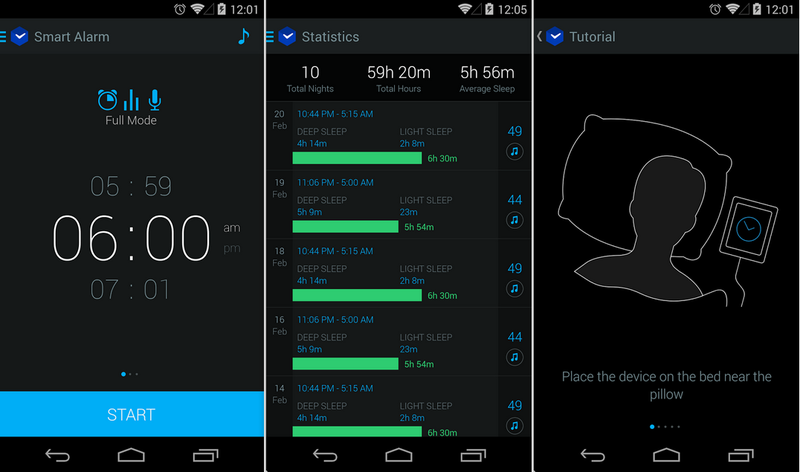 The app uses sensors in common Android phones (you don’t quite need Project Tango to use this) to keep tabs on your movements throughout the night and deduce which stage of sleep you currently are in. It will also record any sounds prolonged longer than 5 seconds, so the snorers out there should be able to hear a recording of themselves after the fact. You are also presented with over 100 “relaxation sounds” to fall asleep to, so there definitely is a use-case for people who have trouble falling asleep. Shown to you after you end your sleep are detailed statistics about your sleep cycles and stages, meaning you’ll get to see your habits and tendencies in terms of phases of sleep. Most importantly, the app will wake you up when you’re sleeping the lightest, but presumably it’ll jump the gun and play the alarm prematurely if your alarm time is fast approaching. Available for $1.99 on Google Play, Smart Alarm Clock may be worth a try for anyone who tends to wake up on the wrong side of the bed a lot.